Mark Jackson, who enjoyed a successful 17-year career as an NBA point guard, helping lead his teams to the playoffs 14 times and becoming one of only 28 players in league history to reach the postseason in 14 different campaigns. In 1,296 regular-season games with seven organizations – New York (twice), the L.A. Clippers, Indiana (twice), Denver, Toronto, Utah and Houston – Jackson amassed career averages of 9.6 points, 8.0 assists, 3.8 rebounds and 1.24 steals per game. Overall, the Brooklyn native recorded 10,334 assists during his career, which is the third-most in NBA history (trailing only John Stockton’s 15,806 and Jason Kidd’s 11,578). He also ranks 12th on the NBA’s all-time list for regular-season games played (1,296) and ranks 24th on the league’s all-time steals list, having recorded 1,608 in his career. Jackson, 46, was originally drafted by his hometown New York Knicks in the first round (18th overall) of the 1987 NBA Draft and went on to become a near-unanimous selection as NBA Rookie of the Year in 1988 and a member of the NBA All-Rookie team. In his second season (1988-89), Jackson averaged a career-high 16.9 points per game – including a career-high 34-point effort at Philadelphia on November 18, 1988 – and made the lone All-Star appearance of his career as a member of the 1989 Eastern Conference squad. In 1996-97, Jackson led the NBA in assists by averaging a career-high 11.4 per contest while playing with Denver and Indiana, snapping John Stockton’s all-time NBA string of seven consecutive league assist titles. That same season, while with the Pacers, Jackson established his single-game career-high for assists when he dished out 22 against the New Jersey Nets on January 20, 1997. Overall, Jackson appeared in 131 playoff games, averaging 9.0 points, 6.9 assists, 3.6 rebounds and 1.00 steals in the postseason. He experienced his most playoff success while with the Indiana Pacers between 1995-2000. During that span, Jackson helped lead the Pacers to four appearances in the Eastern Conference Finals and his lone career NBA Finals appearance in 2000, where the Pacers fell to the Los Angeles Lakers. As a collegiate player, Jackson played four seasons at St. John’s (1983-1987), where as a senior in 1987 he was named Second Team All-American, earned All-Big East honors and was named the Big East Defensive Player of the Year. As a junior in 1985-86, he led the nation with 9.1 assists per game. Jackson was also the sixth-man on the St. John’s squad that advanced to the 1985 NCAA Final Four during his sophomore season. After retiring from the NBA following the 2003-04 campaign, Jackson embarked on a successful seven-year television career when he joined ESPN as a studio analyst prior to the 2004-05 season. In 2005-06, in addition to his continued ESPN work, he began serving as a color analyst for the YES Network’s New Jersey Nets telecasts, a role he filled for three seasons from 2005-08. For the next five years, Jackson served as a game analyst for ESPN & ABC, working primarily alongside Mike Breen and Jeff Van Gundy on the network’s lead broadcast team. In 2011, the Golden State Warriors hired Jackson as head coach. He coached the team for three seasons, leading the Warriors to consecutive playoff appearances for the first time in over 20 years. 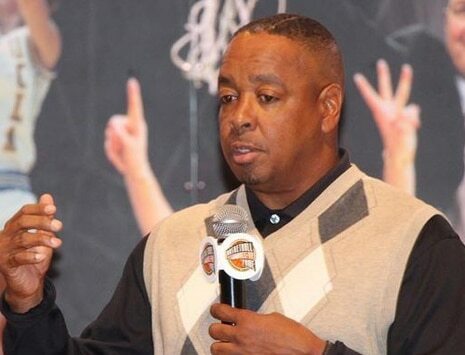 On May 17, 2014, Jackson reached a multiyear agreement to return to ESPN as a game analyst. Jackson earned a degree in communication arts from St. Vincent’s College at St. John’s. Born on April 1, 1965, Mark and his wife, Desiree, have three sons, Mark II, Christian and Micah, and one daughter, Heavyn.